When it comes to car related apps, there are plenty available on the market. Car maintenance, online buying and selling parts, automotive news and what-not, apps are available for all of this stuff. As an avid car lover, one should not skip on downloading an app of this kind, as they can for sure help you save time and money in acquiring parts, accessories, gadgets or mechanic and car maintenance services. Amongst the many on the app stores, we found one that is the perfect blend of all the mentioned above, so continue on reading and find out more about the Tej’s Garage App – the one stop-shop for all things car related. Tej’s Garage App is a wonderful social and market platform for all car enthusiasts. It’s the perfect place where the user can find all kinds of car related stuff, from the option of buying and selling parts and accessories to the option of finding and organizing car meets and convoys in their local surroundings. Tej’s Garage App aims to be the first and the best of its kind, bringing the avid car enthusiast’s community closer by presenting a app-based platform where they can buy, sell, trade parts, accessories and services, and hosting, organizing and finding car meets and convoys. 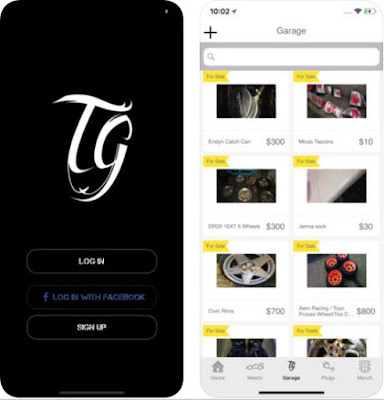 Tej’s Garage App prides itself in streamlining the P2P purchasing, selling and trading of automotive goods and services within reasonable and accessible price ranges. Users can sell their old parts, buy new or used ones, and find or offer car maintenance services to other users. Payment can be done by PayPal or Cryptocurrency transactions within the app, or via cash when in person with other users. If you are interested in trying it out, you can find and download the Tej’s Garage App for free at both, the App Store and the Google Play Store.